Not since the end of the Cold War has Russia loomed so large in German-American relations, due in large part to recent developments in Ukraine. Germany’s geographic proximity and economic ties to Russia give Berlin and Washington different stakes in the current confrontation with Moscow. According to a new Pew Research Center survey conducted in association with the Bertelsmann Foundation, a majority of Germans (57%) believe it is more important for Germany to have strong ties with the United States than with Russia. Just 15% prefer strong ties with Russia, and another 21% volunteer that it is best to have an equally close relationship with both. However, the legacy of World War II lives on in public opinion: East and West Germans differ on how they view ties with the U.S. While 61% of Germans living in the West prefer a strong affiliation with America, just 44% of people living in the East agree. 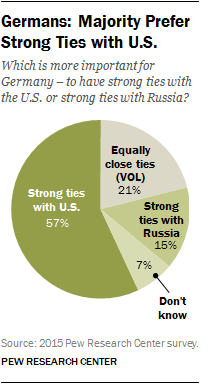 And while 23% of people in the East voice support for strong ties with Russia, only 12% of those in the West agree. On the issue of Ukraine, and what to do about Russian activities in the Crimea and eastern Ukraine, when asked if it is more important to be tough with Russia or to have a strong economic relationship with Moscow, half of Germans voice the view it is more important to be tough. In spite of Germany’s long-standing economic and energy ties with Russia, only about a third (35%) say a strong economic relationship is more important. Notably, younger Germans (53%), ages 18 to 29, are much more supportive of standing up to Russia over Ukraine than are older Germans (36%), ages 65 and older. But Americans are much more supportive of taking action against Russia than are Germans. More than half of Americans (54%) believe that U.S. policy is not tough enough on Moscow. And 59% of Americans say the European Union is not being strong enough. At the same time, roughly six-in-ten Germans (62%) think the U.S. position with regard to Russia is too tough (27%) or about right (35%). Similarly, 62% of Germans believe that EU actions against Russia are too strong (18%) or about right (44%). Older Americans (65%) are much more likely than younger ones (45%) to hold the view that the U.S. is not being tough enough on Russia. Republicans (69%) are also more critical than are Democrats (47%). In Germany, supporters of the left-of-center Social Democratic Party (39%) are more likely than adherents of the right-of-center Christian Democratic Union and Christian Social Union (23%) to voice the view that the U.S. is being too tough on Russia. And East Germans (27%) are more likely than West Germans (16%) to say that the EU is being too tough.